Beyond Addiction has changed my life. I came in without much hope and I feel now, for the first time in a very long time that life is full of possibility and that I have the confidence to face the challenges it offers me head on. I don’t want it to ever end. You will never regret this course. Do it! And take it with as much compassion, consciousness and support as you can. The Beyond Addiction course offers a unique experience to learn about your self and why you do what you do. It helps answer the great “why can’t I just stop?” It gives you hope and the opportunity to learn what will change your life. 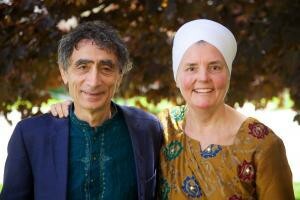 The BA program is amazing – packed full of knowledge, techniques, wisdom and powerful kundalini yoga that supports the healing of the whole self, psychologically, physically and spiritually, along with self-discovery, nutrition, yoga, community and the wisdom of Sat Dharam Kaur and Gabor Maté. Give yourself this gift. The Beyond Addiction program has been helping people since 2008 and is an internationally recognized treatment for anyone with addictive behaviours that helps to build healthy, resilient individuals, families and communities. The program supports individuals in establishing healthy thought patterns and behaviours to nourish mind, body and spirit and manifest an inspired and fulfilling life. The course comprises a 16 session recovery program which includes Kundalini Yoga, breathing techniques, meditation, relaxation, self-reflection, lifestyle and dietary guidelines, stress management, hydrotherapy, naturopathic detoxification and nutritional and herbal supplementation for neurotransmitter and glandular balance. The program was developed by Sat Dharam Kaur ND and Jivan Joti Kaur PhD, and integrates the teachings of Yogi Bhajan, Dr. Gabor Maté and experts in the addiction field. Click here for more information. The Canadian Addiction Counsellors Certification Federation has approved Beyond Addiction: The Yogic Path to Recovery for 42 core CEUs. Compassionate Inquiry is a psychotherapeutic method developed by Dr. Gabor Maté that reveals what lies beneath the appearance we present to the world. Using Compassionate Inquiry, the therapist unveils the level of consciousness, mental climate, hidden assumptions, implicit memories and body states that form the real message that words both express and conceal. Through Compassionate Inquiry, the client can recognize the unconscious dynamics that run their lives and how to liberate themselves from them. Dr. Maté will model the process of Compassionate Inquiry with course participants and instruct therapists in the practice of this powerful technique to help clients access deep healing and transformation. This will be both an experiential, participatory workshop where participants will be guided through their own personal process, as well as a training to teach the method of Compassionate Inquiry to health professionals, therapists and social workers. See upcoming Compassionate Inquiry Workshops.